On August 30, 1956, the Lake Pontchartrain Causeway, the world’s longest bridge over water, opened outside New Orleans, Louisiana. The Mississippi River snakes through the Crescent City of New Orleans, Louisiana in this fantastic satellite image. The large body of water to the city's north is Lake Pontchartrain, bisected by the longest bridge over water in the world, the Lake Pontchartrain Causeway. On August 30, 1956, the Lake Pontchartrain Causeway opened across Lake Pontchartrain, Louisiana. The Lake Pontchartrain Causeway is the longest continuous bridge over water in the world. 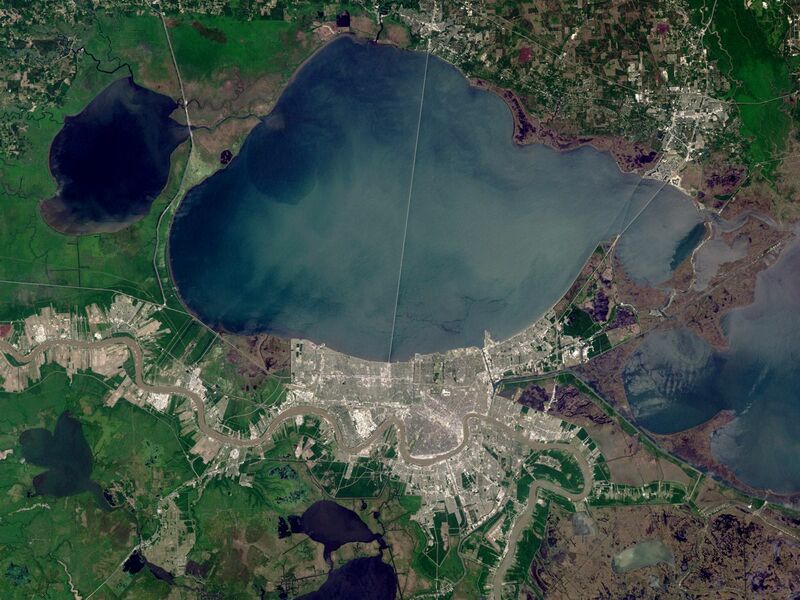 The Lake Pontchartrain Causeway links the urban area of New Orleans, Louisiana, with the smaller communities on the north shore of Lake Pontchartrain. The roadway is 38 kilometers (24 miles) long, and supported by 9,500 concrete pilings. The Lake Pontchartrain Causeway benefitted residents on both sides of the bridge. People who worked in the city had their commute time reduced drastically. The bridge also increases business for retail stores and restaurants in towns on the north shore by allowing New Orleanians and tourists greater access. to be helpful or useful. structure connecting areas otherwise difficult to travel. strong, vertical support structure, such as a pillar. structure, usually made of metal or wood, hammered vertically into the ground to serve as a foundation or wall. having to do with the sale of finished goods to consumers. human settlement larger than a village and smaller than a city.